One fit mom of three! 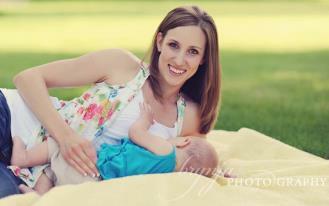 Photo from Brynja Photography- Spokane Washington. How do you lose the baby weight? How do you get back into shape after you have given birth- especially when busy with a new little one? How do you lose weight when you have many children to care for? There is an overabundance of weight loss information out there. I can't say I study it much. But I do think that much of it comes from people who don't have any- much less MANY children. Everybody is on a different journey and in a different place in life but I wanted to tell you about a few things that have worked for me when it comes to losing weight after having children. I should be honest- I am not a super fit hard body. I could stand to lose five or 10 pounds. I don't look like a personal trainer. I stand in awe (and a little afraid) of Jillian Michaels. I also never struggled with my weight before I had children. I was always healthy and happy without trying very hard. With each pregnancy I gained between 40 and 55 pounds and it was not easy to lose it. In fact I was shocked at how hard it was. It looked to me like every other woman on the planet just slipped back into their old jeans within a few weeks while I puttered around in yoga pants and a baggy t-shirt. So here are a few things that helped me, a mother of four, get back into shape, feel good about myself, and be at a healthy weight for me, after giving birth to my four children. Some of these things worked well for me at different stages in my life. The things that worked after I had my first are different than the things that work now that I have four and two of them are in school. I know when I have a baby I have been feeling a little large for some time. It is easy to want to go nuts exercising to lose that baby weight right away. Don't. I find that taking care of yourself and resting for about six weeks means that recovery is faster and you are able to do more later with fewer negative consequences. Women sometimes really hurt their bodies by doing too much too soon after having a baby. When you feel well enough- do something easy- WALK. Also, take into account your pre-pregnancy health. Some may feel like running after six weeks, others may not. With my first baby my daily walks were a lifesaver. They got me out of the house and they were a quiet moment in my day. I put the baby in a sling and and he would happily fall asleep and I would take my first deep breath of the day. Simple- but bliss. When I had my first baby I realized pretty quickly that I had about 30 pounds to lose. I had never had to lose weight before so I made myself a simple goal- I would walk six days a week. For me the six days meant that I had to go every day (except for Sunday- that was my day off). I knew that if I set a goal of exercising three days a week I would put it off and it would get to be Friday and I would realize that I hadn't done anything and then I would feel guilty and eat donuts. So my plan was simple- walk six days a week. Any amount worked. Some days all I had time for was one walk around the block. It didn't matter- just as long as I did SOMETHING. Something is better than nothing. Walking was something I could accomplish even with a little baby. I felt good if I just got out there and did it. It might be something very different that works for you. Some people have access to a gym with childcare. Some people have a group of women that they can trade baby sitting with. Maybe you prefer swimming or running or exercise videos or yoga. Do what you can do and don't make excuses. Find something that works. SOMETHING works. One thing that helped me a lot to lose the post baby weight was planning on running a 5K periodically. I did my first one when my first baby was about 8 months old. You know what? My time was HORRID! Laughable. But I did it and it made me feel great. I had never been a runner and it was hard for me. I am naturally clumsy and I will never be a great or fast runner. But my goal was to finish and to finish without walking. When I hit mile three and I wanted to quit I just kept telling myself that I pushed for four hours and gosh dang it- I could finish this stupid race! I found that picking 5K's to run that were near me was incredibly motivating. While I could lose most of the weight by simply walking, adding some running in would get another 10 pounds off because of the added intensity. Often you can enter a 5K pretty cheaply- or if you lack funds, sometimes you can just go "run it" without being signed up. Your time won't be recorded and you don't get a t-shirt but you still get to be out there with other runners. A 5K isn't that long (just over 3 miles) and there are all different levels of runners out there. They are fun and motivating for anybody no matter what their fitness level. I ran one when my second was very young and I pushed a double stroller and nursed midway. It was a disaster! But I still finished! As I mentioned before, sometimes to get in optimal condition after having a baby you have to increase intensity. This isn't always easy- I don't actually enjoy physical pain for the sake of a certain size jeans. But it is surprisingly addictive and it does in the long run make you feel better. It also pushes your body a little farther and often increases fitness and weight loss. For me I add running to my walking about three or four days a week. For some people adding weightlifting helps, circuit training, increasing time or changing things up. Personally the idea of weight lifting makes me want to spew so I don't do that. Find what works for you. The best shape I have ever been in was after I had my third baby. Why? Because I had a great running partner. She showed up at my house every morning, rain or shine (oh my gosh it rains here in nor Cal) and dragged me out the door. She helped me go farther than I ever would have on my own. She would push me but not too far. We would talk and run and it was absolutely fabulous. I am so grateful to her for doing that for me. I couldn't have done it for myself. Finding a partner helps. This can work in lots of different ways. After my first I found a group of women who would go to a local recreation center a few days a week and trade off watching kids and exercising. Half would stay in a room and baby sit while half used the exercise machines and then we would trade. It was a free and simple way to get a work out. Some women have a wonderful husband or partner who will watch the kids while they exercise. For me, after I had a few kids I just had to get up super early if I wanted to run. It was so worth it though and a great way to start my day. After another pregnancy I joined an online "biggest loser" group to get in shape post-baby. It helped me be accountable because we had to weigh in every week and it helped me stay focused. It also helped me be a little competitive! But mostly it was great to see the ideas and inspiration from these other awesome women! That online support group was a huge help for me. Find help- it will be in unexpected places. One thing that helped once I had children was to simply be active. The only possession I had that I valued was really my stroller. I walked EVERYWHERE. To the store, to get kids at school, to the park, to swim lessons, to get out of the house to visit friends, to go to play dates, etc. I know this doesn't work for everybody- but something will work. If you can walk then do it- Is it harder to walk with kids than put them in a car? Absolutely. It also gets the kids out and moving (good for their health and your sanity) and it is a great example. And they take better naps. For me some of my best family moments of peace come during a walk. Some of the worst fits come then too but it is worth it. Take the stairs, work in garden, dance with the kids, walk the dog- SOMETHING in your life requires activity. Do it and you will find some of your best memories and sweetest moments- and you can do it with your kids. ~Add more vegetables and fruits. ~Cut the white and processed junk out. I know that for me- if I am trying to do a specific "diet" I end up obsessing about food. "Oh my gosh. I can't eat bread. I want bread. I need bread. Maybe if I make it it won't be bad for me. Somebody find a wheat grinder. HOLY CRAP WHERE IS THE BREAD??!" To be as healthy as I can be I can't just exercise. I have to clean up my nutrition. My hubby says it is better to "add things" than "take away things". So he tells people to focus on INCREASING the good things and the bad things will naturally fall away. More veggies. More raw. More whole foods. Eventually you will be eating LESS simple carbs and things in a package. You will be full of nutrients and won't need the junk. I remember seeing an episode of that TV show Scrubs- (Does anybody watch that anymore? So funny.) Dr Cox was asked how he stayed in such good shape. He said the key was to look in the mirror and hate what you see. I TOTALLY did that after I had my first baby. I would torture myself trying on the same skinny jeans week after week until I lost that baby weight. Looking back- I don't even remember if I ever fit in those jeans again. I don't have them anymore and I am sure they are out of style. I did lose the weight- but my body isn't the same and hating yourself doesn't usually help. I have heard people say that if you exercise and eat right that your body will be just as it was before kids. I politely disagree. Actually- this MAY have been true after my first and second, but after the third and fourth baby there was permanent change. My hips- I SWEAR- are wider. Even in the best shape of my life after my third baby things just sat DIFFERENT. Sag is inevitable. If you have enough children and you gain a considerable amount of weight with them, chances are you will have stretched skin, stretch marks, and some things that aren't that firm any more. Guess what- That is OK. This post isn't about hating your body or never being satisfied or the necessity of fitting into a size 4 or looking great in skinny jeans. It isn't about looking the same as anybody else or the same as you used to be. My goals will be different that yours. What works for me will be different than what works for you. It is about setting goals you can accomplish that help you feel better about yourself and help you be the kind of mother you want to be. It is about showing your kids that caring for themselves is important. It is about showing yourself that YOU still matter and YOU are worth some effort and time. You know what- it IS harder for me to find time to exercise now that I have four children. I am sure it is hard for women who have even more children. But I don't think it is impossible to do kind things for your body. And I don't think it is selfish either. Find the time, set some simple and obtainable goals and take a moment each day to nurture your own health. It will be worth it. For me, no amount of "exercise and a healthy diet" works - the end result is just frustration. The only thing that has worked is carb restriction - I'm doing that right now for other health reasons, and without any other effort, I have lost 35 pounds in four months (that's cutting grains, legumes, fruit, most dairy, and starchy vegetables). Restrictive, but it works! Now down to the last 15 that I need to lose - it's a lot slower at the end (dang! ).